Bake biscuits as directed on package. Meanwhile, in medium bowl, mix strawberries and 1/3 cup sugar; set aside. When biscuits come out of oven, brush with melted butter and sprinkle with sugar. Cool 5 minutes. 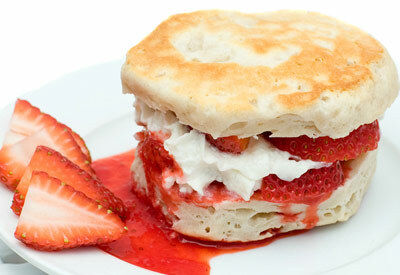 To serve, split biscuits, top with strawberry mixture and whipped cream topping.